The Abyssinian Meeting House (1828), the only documented surviving 19th century frame meetinghouse in the downtown wards of Portland, is the historical, religious, educational and cultural center of Portland's 19th century African American population. It is the earliest meetinghouse associated with an African American population in Maine and the third oldest extant African American meetinghouse in New England. Because of its easy access by rail and sea, Portland developed as one of the northernmost hubs of the Underground Railroad, the last stop before legal freedom outside the country. When the Fugitive Slave Act of 1850 was passed, it allowed slave owners and their agents to track down freedom seekers in the north and return them to slavery. Portland's black and white activists reacted, providing them safe houses and helping to organize escape routes to England and Canada. Despite the trepidation of some members, the Abyssinian Meeting House was closely associated with the Underground Railroad and with local abolitionist activity prior to and during the Civil War. Ministers, leaders and members of the Abyssinian Church actively participated in concealing, supplying, and transporting refugees from slavery, as recounted in slave narratives and oral traditions. The Portland Union Antislavery Society, founded June 1, 1842, was one of several grassroots movements advocating the abolition of slavery in the South. The founding meeting was held at the Abyssinian Meeting House. Biographies, memoirs, and slave narratives call particular attention to the Underground Railroad roles of Reverend Amos Freeman, Charles Eastman, Addison Parsons, and Reverend Amos Beman. Reverend Freeman was the minister at the Abyssinian when the Fugitive Slave Act of 1850 was passed by Congress. Charles Eastman was a leading layperson who joined the Abyssinian in 1850. Addison Parsons was a white teacher at the Abyssinian "colored school" in the mid-1850s. Reverence Amos Beman was minister at the Abyssinian in the years leading up to the Civil War. The only known reference to the use of the Abyssinian meetinghouse itself as a place to hide fugitive slaves is in the unpublished memoirs of a descendent of Reverend Freeman. 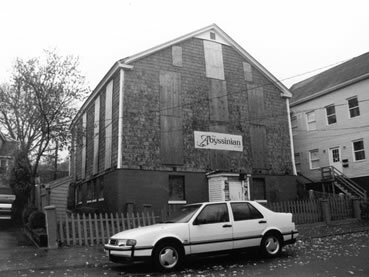 The Abyssinian Meeting House is located at 75 Newbury Street, Portland, Maine. It is currently under restoration.